SMART repair franchise, Car Medic Ireland, is welcoming interest from those who want to purchase a profitable business and become part of its growing network. Since acquiring the Master Franchise rights for Car Medic Ireland in 2009, Paul Callan (pictured right) has successfully developed its franchise network and has recently sold his ninth franchise. Car Medic offers SMART repairs and provides a convenient, mobile cosmetic bodywork repair service. This business model has low overheads thus providing the consumer with low cost repairs. 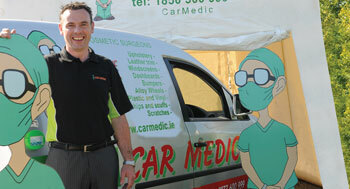 Car Medic operates in six counties in Ireland. They are Louth, Dublin, Limerick, Waterford, Wicklow and Wexford. The Car Medic Ireland franchise package is just €15,995 and includes intensive training, full technical support and back up.